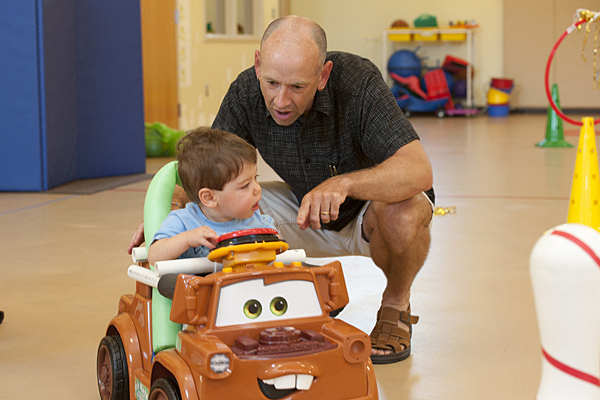 Cole Galloway, professor of physical therapy at the University of Delaware, has received a three-year, $515,000 grant from the National Science Foundation to answer some new questions about infant development in the GoBabyGo project. 4:14 p.m., Jan. 13, 2014--The GoBabyGo project at the University of Delaware helps babies with mobility impairments become mobile as early as possible by “driving” robots and modified racecars. Although these babies have been highly mobile, new findings suggest that as toddlers they may have serious limitations in using their wheeled mobility for socialization. This situation was a wakeup call for Cole Galloway, who leads the GoBabyGo research team. A three-year $515,000 grant from the National Science Foundation will support this new work, which has two basic goals. The first is to determine whether developmental changes are triggered by active driving itself or are simply the result of the enriched physical and social environment children are exposed to during mobile robot training. For this aspect of the research, a pair of infants will be placed in an innovative two-seat robot in which both babies have joysticks but only one drives the robot. This scenario will provide both infants with the same physical and social experiences but only one child with actual control over where the robot goes. The second aim of the research is to establish whether robot-guided social mobility can produce advanced socialization in combination with driving skill. Galloway explains that as soon as typically developing infants start walking, they tend to follow other people around. He believes that this co-emergence of mobility and socialization, also known as social mobility, is critically deficient in many children with mobility impairments. Working with long-time collaborator Sunil Agrawal, Galloway saw the potential to use existing robotic technology to advance the social mobility of infants. Specifically, they will use a technology package Galloway calls “soft social assembly” which links mobility experiences to social interaction. “Basically, as the baby is learning to drive, the robot can either bias her position toward areas where other kids are playing together, or let her drive solo without any bias or social assistance,” Galloway says. As with much of Galloway’s work, this research will be carried out in UD’s Early Learning Center, the “test track” for the GoBabyGo project. The research is funded by National Science Foundation grant BCS-1252876. The GoBabyGo project recently moved into the Pediatric Mobility Lab and Design Studio at the University's Science, Technology and Advanced Research (STAR) Campus.